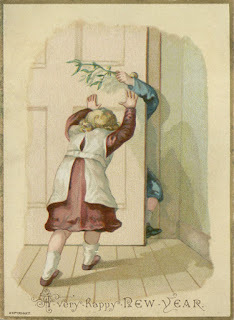 If you have been following this blog for more than a year, you will know I have problems with the bit between Christmas and New Year. I slump into a malaise, a fit of ennui that lasts until I can start planting seeds in February. It is dark, it is cold and it is pointless and filled with resolutions that I inevitably break and are painful in the meantime. Ugh. No wonder we need a New Year bash to cheer us up or else we'd just be circling the drain until Spring. Wowser. 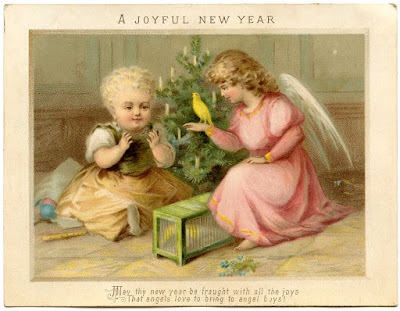 Nothing says New Year like an angel bringing your fat baby a canary. Bearing in mind that the tree behind them is covered in candles, I think that scenario will end in trouble and the unmistakable smell of burnt feathers. In quite a few, the moon-man is being plied with alcohol by little angel-fairy things. Alcohol does seem to play a reasonable size in proceedings, hence fist-fights I suppose. As the nights draw in, alcohol does tend to come into its own, possibly to alleviate the gloom, cold and general pointlessness of existence. Cider for Mrs Walker! 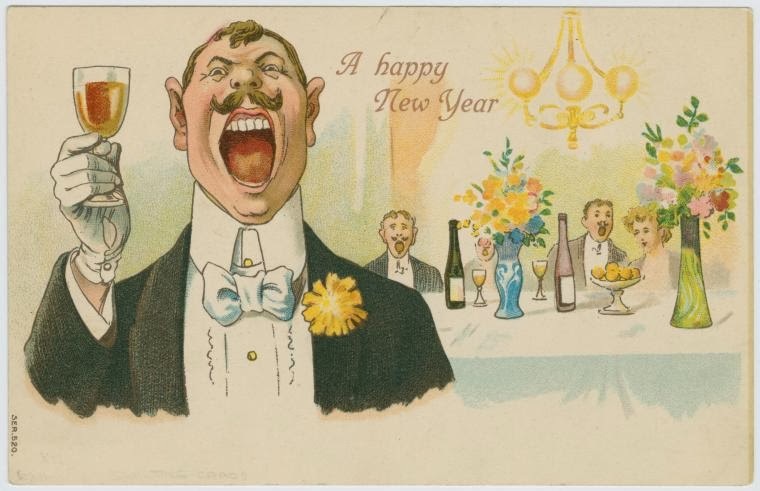 Of course, with drinking comes vomiting, if done to excess. How splendid it would be if coins came out! Okay, well maybe not splendid but rather handy at this time of year when I don't know about you, but I'm rather broke after Christmas. 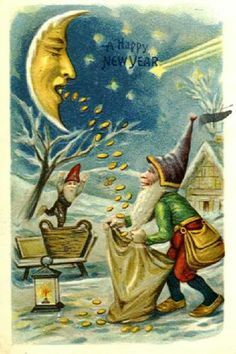 Maybe I should hang around outside with a sack tonight in case the moon starts projectile vomiting cash. There's a pretty thought. I blame the gnomes. There is a 'drunken gnome' motif to many of the cards, seen here above being discovered by a self-righteous pig. 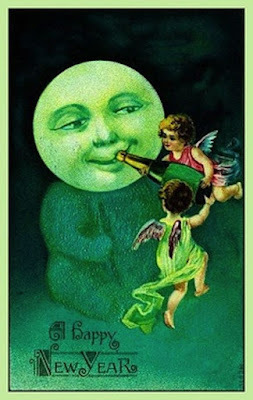 If they are not encouraging the moon to drink so much it vomits, then they are getting smashed themselves. Gnomes, you have a problem, go home. No, not a clue. This is what happens when you drink - a card with a potato in leather boots seems perfectly acceptable. This is how friendships end. 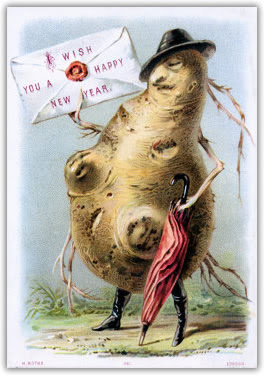 The Chitted Potato of New Year may arrive at your house tonight. Don't say I didn't warn you. It's not only weird vegetables we have to worry about tonight, but also giant insects. 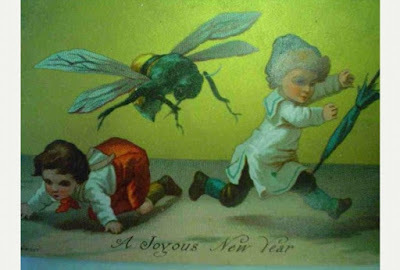 This New Year lark is a nightmare. Won't someone please think of the children? The best thing that can happen to children in 2017 is to be sprayed by a vengeful circus elephant. I'm not sure that's a narrative I wish to endorse, however if that bunch of velvet-clad Little Lord Fauntleroys were near me, I might be tempted to unleash the nose-cannon too. Especially the one in the sailor suit. Really, Social Services should be involved in some instances. Case in point is a card that says 'I hope 1890 brings you child-flavoured soup'. 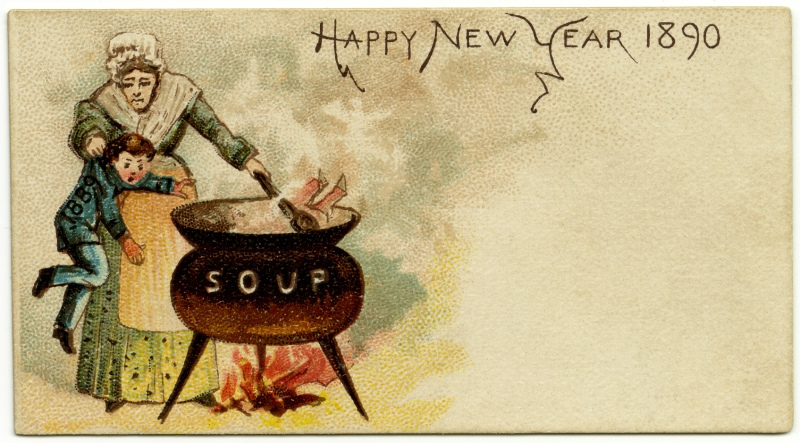 I see that the child represents 1889 and so is going into the soup because it's delicious, or something. 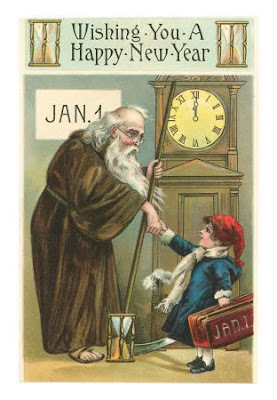 I thought the old year was an old man and the new year is the child? 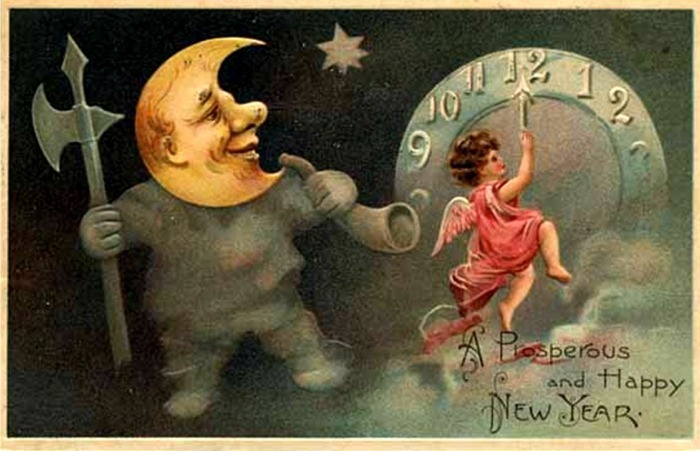 Yes, like this, although poor Old Year looks like he is being assaulted by the cute New Year. Actually, he's Father Time and he is being 'taken by the forelock', whatever that means. It sounds like that motivational speech, where you are meant to take things 'by the horns', that sort of thing. 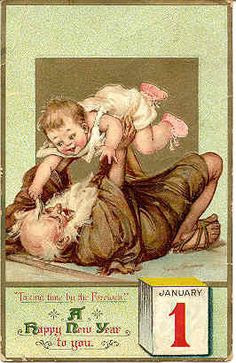 Go out and seize old men by their hair, it's what the Victorians want you to do. Actually, don't do that, just shake them by the hand, that's more respectful and less likely to end in a lawsuit or arrest. I have a questions about allowing children that young to be socialising at that time of night, even metaphorical ones. That can't end well. See? All that carousing and staying up to all hours, ends up with this sort of malarky. 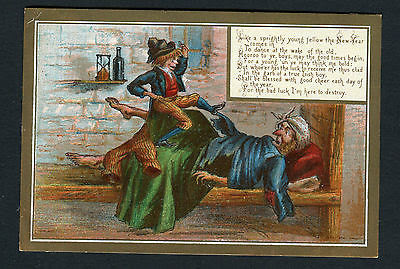 This rather dubious card shows a young girl fighting off an over eager suitor. For heavens sake. 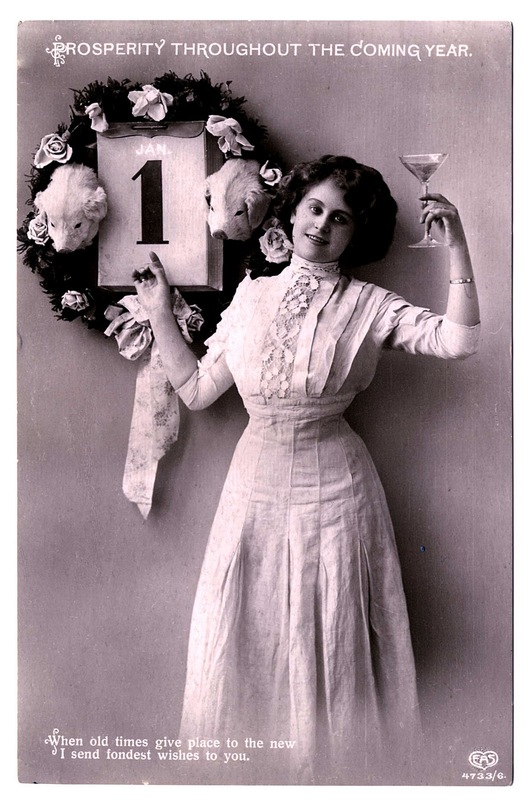 I know you could get married at 12 years old in Victorian times but it wasn't recommended. 'If you want to kiss something, kiss the door!' exclaimed little Emily as she slammed it in his face. Why is the lute-playing pierrot doing yoga in the snow? 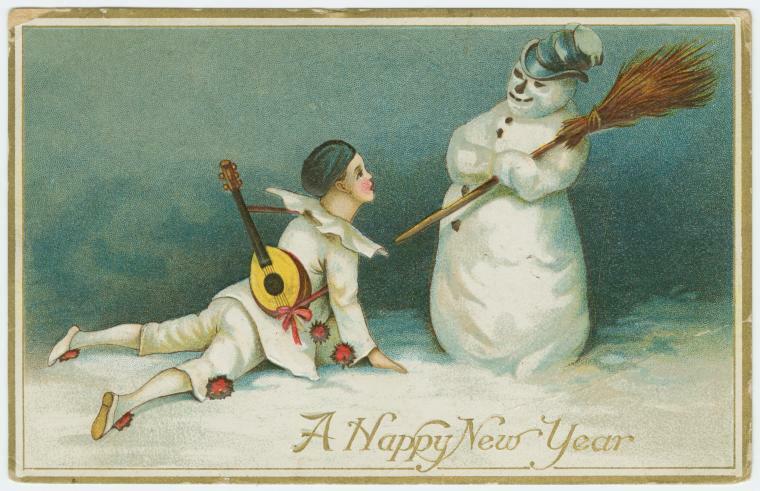 Why is the snowman watching him? With a broom? 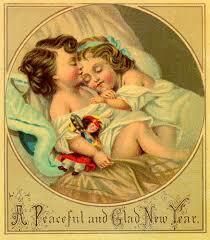 How does any of this pertain to New Year? This one is almost normal. 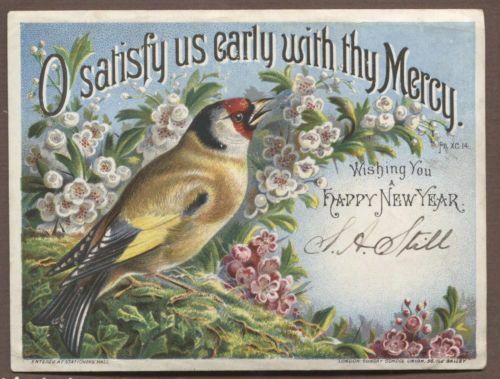 A goldfinch herald in the New Year with the promise of blossom and all good things, but then the words read 'O satisfy us early with thy Mercy'. Wait, what? What do we need mercy for and why does it need to be rushed in at dawn? What exactly are we all getting up to tonight? Heavens to Betsy, I've had some rare old times but never have I had to ask for God's forgiveness at the end of it all. Blimey. So I'll end with possibly my 'favourite'. 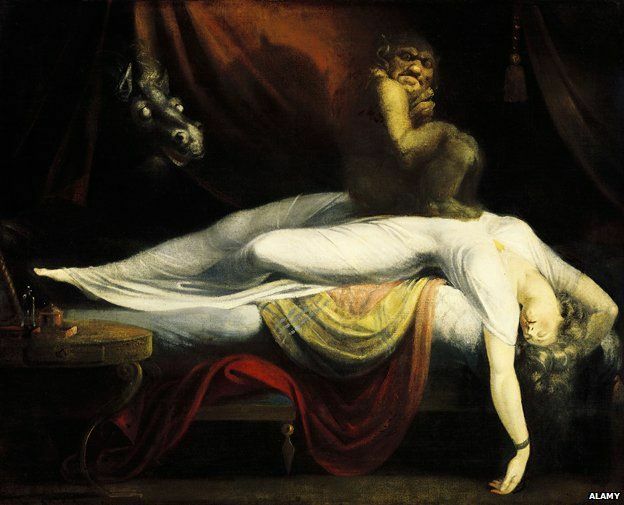 Here is a little known fact about me that possibly I shouldn't be sharing - since I was a child my nightmares have regularly featured people screaming but no sound comes out. 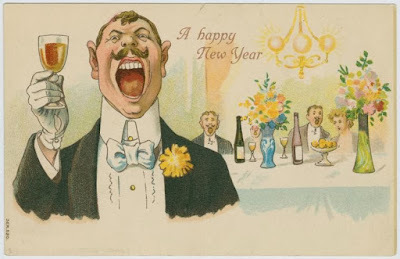 Now, I'm sure that is psychologically significant but if I got to pick a New Year card that freaked me out the most, I would pick this one where everyone at the party has started screaming together while making a toast. I am left to wonder what they have seen that causes they all to scream - is it the zombie apocalypse? 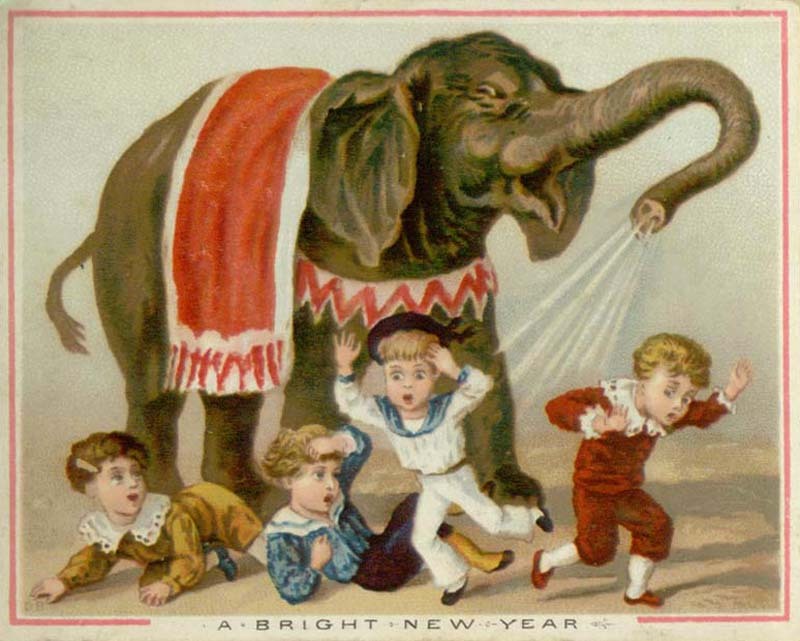 Have they all noticed the little girl standing with her back to them in the corner, holding the dripping knife? Lovely. Have a good one. 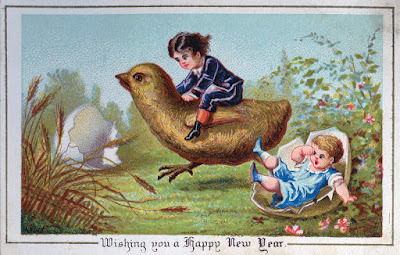 Okay, look whatever you are up to, have a lovely, safe time and I think I might have found the perfect card for you all. 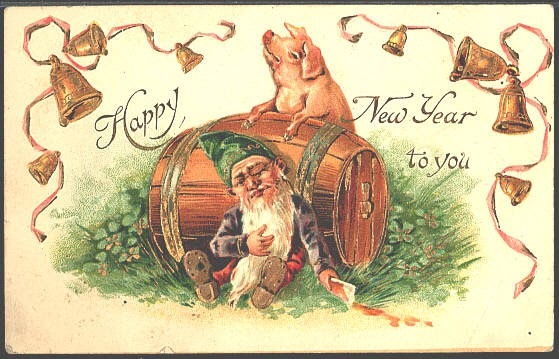 I wish you all prosperity through the coming year, with very little vomiting, no matter how much the gnomes make you drink. 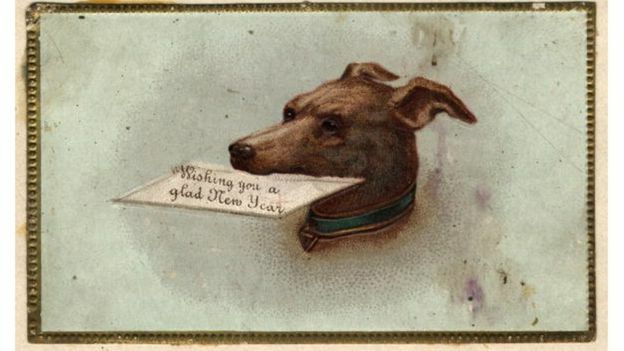 And I truly do send my fondest wishes to you. I had only a faint sketch of my late sister, Sophia by her husband, the artist Philip Archer. His art, though extremely accomplished, had no charm for me, much like the man himself. That one sketch though was pressed upon me after her funeral. He had wrapped it in black tissue, a farewell present as the frost and dirt still clung to my boots. He expected never to see me again and so I was to be dismissed with this half-work of her, dressed as an angel, her arms outstretched in a darkened room. He kept the oil, finished but never shown. I will say that in his defense, he never showed that last painting nor sold it. It hung on his landing, a curtain carelessly pulled back next to it so that it was partly obscured. 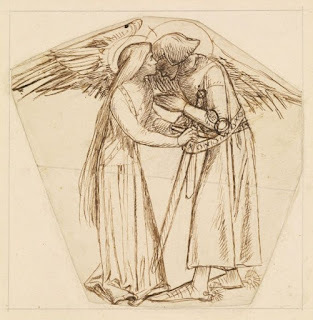 My angel-sister was all but forgotten by Philip Archer until the third Sunday in December. That’s when I received a note. It was brief, heavy-inked letters spelling out two words. I did not relish the trip to London, so comfortable had I become in my rooms in Oxford. I had my work, my books, my little cat. His letter had disturbed me, and had been swiftly followed by a note by a ‘Dr Carstairs’, a friend of Philip’s, which did nothing to ease my mind. ‘Miss Davis,’ it began, ‘Forgive the imposition upon your time by one who is not known to you but I believe you will have received a letter from my friend, Philip Archer. I do not need to tell you what a shock your poor sister’s death was to him and how he has grieved deeply for her, but of late that grief has turned to something less healthy. I sent a cursory note in response and packed a meager bag, not wishing to stay for more than a couple of days under Philip Archer’s roof. Poor Sophia. I missed her every single day and the grief I felt was indeed overwhelming at times. What that man felt was not grief. It was guilt. I arrived at 15 Wisteria Grove, Chelsea, on foot, not wishing for, nor affording, the expense of a carriage from the station. The walk did not put me in a better mood, as the approach to the house was too heavily reminiscent of that day almost a year before when I had rushed to my sister’s side, but found all her beautiful life extinguished. A young maid let me in to the hall and I immediately averted my eyes from the staircase. Philip Archer was motionless in a gloomy doorway and so I did not see him to begin with. When he moved towards me I was frankly amazed at the damage a year could do. He was wrapped in a smoking jacket that had seen better days and his hair and beard were unkempt. I was too surprised at his appearance to avoid his embrace, so my cheek was grazed by his lips and the smell of brandy assaulted my senses. I stepped back in disgust and for a moment he looked aware of how far he had slipped. He brushed a hand over himself to smooth the inconsequential creases and fiddle with cuffs. ‘As you see,’ I finally replied and he nodded before beckoning me to follow, striding purposefully towards the stairs. The maid bobbed at my side, her fingers taking my bag from me. ‘Glad you are here, M’am,’ she whispered, and I nodded. ‘Where are you Olivia?’ the artist called, sounding angry suddenly, his voice travelling down the stairs to the little maid and me. She jumped and scurried away, up the stairs. I followed. There on the landing he was waiting in front of the painting. His breathing had become rapid and he turned to the picture, closely studying it before turning back to me as I approached. ‘Mr Archer? Philip?’ I asked, trying to keep my voice gentle. ‘See now, here, look here. Closer!’ he barked at me as I moved to view the painting, and tried to grab my arm but I easily shook him off and he seemed to remember himself. For a moment, the artist fluffed a little with pride, and turned to view his work like he used to, the conceit of talent angling him. Then he saw Sophia again, her arms wide and the pretense slipped, like my poor sister’s feet on the stairs. I looked at the painting, then back at him in confusion. The small maid was summoned and she appeared at her master’s side swiftly. ‘Sir?’ Her voice was soft and I remembered her quiet sobs when I had arrived a year ago. Bessie paused, her lips forming words but none arriving. Her eyes flicked to the side repeatedly and she closed her mouth, her chin decisively dipped as if her story was ordering itself for the consumption of others. Philip gave a roar of impatience, but was drowned out by the bell at the front door clanging. Torn between following her master’s instruction and the call of duty, Bessie hurried out her story. Philip dismissed her unpleasantly, his hand pushing her away so that she wobbled at the top of the stairs. I moved forward sharply and caught her forearm. She and I exchanged a look of solidarity. ‘Answer the door, Bessie,’ I instructed softly, releasing her arm and she nodded, grimly. ‘I’m glad you’ve come, Miss,’ she repeated. The visitor was Dr Carstairs, or Albert as I was instructed to call him. A jovial man with red whiskers and a ready smile, he was Philip’s physician and had grown to be his friend, mainly due, he confided, to a lack of others. I think this last piece of information was meant to make me feel an appropriate sisterly warmth towards the artist. ‘How long have you attended my brother?’ I asked as we sipped tea in front of the parlour fire. Albert cast a look over at the snoring form of Philip who had fallen asleep in the far chair. I nodded, letting the subject of my sister rest for the moment. ‘And he claims the painting moves? That it starts in one room and ends up in another?’ I asked and he gave a short laugh. ‘What? How do you mean?’ I exclaimed and he gave a pained look. ‘Well, of course it does!’ I exclaimed and he nodded. ‘Yes, I see.’ I spoke sharply for which I was sorry. ‘I shall do what I can,’ I added, my tone softening, and the doctor nodded, a tentative smile on his lips. I relaxed a little in the chair as the man leaned forward with interest. ‘Of course, I saw your father in Macbeth at the Lyceum, he was a powerful actor.’ There was something of the enthused school-boy about Dr Carstairs as he spoke. I nodded indulgently. ‘Some consider it his finest performance. It was one of his last. The influenza took him and our mother the year after.’ My voice trailed off and again our guest looked embarrassed. ‘My condolences, a great loss,’ he hurried out. I felt guilty for my folio of tragedies and attempted to alleviate his discomfort. ‘I had no talent for the boards, I could not remember the lines. My father set me to work with Edwin Gordon on sets. That man could make you think a city lay stretched before your eyes, or the inner sanctums of a baronial castle. I was fortunate to see the theatre from such an angle.’ I ended with a smile and he looked relieved and genuinely interested. There was a moment of silence as I sipped my tea and he looked over at his friend. When he looked back at me, he gave a quiet chuckle of relief and self-congratulation. The next morning, three days before the anniversary of Sophia’s death, I awoke to the sound of ranting from outside my room. Hurrying into my dressing gown, I did not stop to consider my appearance before opening my bedroom door. In the narrow passage leading to the stairs, my brother-in-law was electric with excitement. I knew where he would be even before I saw him. Sheltering on the stairs below, her face creased with concern, was Bessie, who did not dare to come any closer. ‘Philip?’ I called softly and he turned, looking delighted. He ran to my side and dragged me to the painting of poor Sophia. ‘What is it I am meant to be seeing?’ I asked, and his fingers suddenly pressed the back of my head closer to the image. I felt strands of hair pluck from my scalp under his grip. ‘Please release my head from your grasp, brother,’ I whispered coldly, all pity gone in the sting on my scalp. His hand retracted with a jerk and suddenly was on my shoulder, as if to steady me. I stood back, brushing his touch away. My answer was partly fuelled by the soreness of pulled hair, but his face was suddenly doubtful and he turned again to the picture. ‘Philip, please, let us go down stairs, let us eat breakfast. It is too early for this.’ I raised my hands in defence as he moved sharply towards me. ‘Olivia, please, please say you can see it.’ His voice was plaintive, pitiful. I bent forward, and made a show of studying the painting. To his credit he looked ashamed and reached out a conciliatory hand which I flinched from but then allowed him to place on my arm. With that he moved past me and down the stairs, as Bessie skittled away in front of him. After he had vanished below me I realised I had been gripping the banister so tightly behind me, my fingers had cramped. Two days before the anniversary of Sophia’s death, and I was once more awoken by the sound of Philip’s voice. This time it was near, very near, invading my dreams and dragging me into consciousness. I was plucked from my bed by strong, manic hands and, in my nightdress, I was hustled to the top of the stairs. I gurgled complaint that turned fearful as my hand slipped on the banister, but he hauled me to the painting and waited for my comment like an excited child. His hand was hot and tight on my arm. I tried to pull away and he looked crestfallen but still maintained a grip upon me. We were too near the top of the stairs. With my free arm I was holding the banister but if he fell into me we would both follow Sophia to the bitter end. There was a pause and his fingers slackened on my upper arm, then released. He brushed past me and down the stairs, murmuring apologies in a distracted, disturbed voice. I did not relax until he had vanished into the dining room. In front of me the painting of my sister with her golden wings was bathed in morning light coming from the windows on the landing. She had drawn closer to the frame. She was smiling. The day before the dreaded anniversary, I woke to a house subdued by quiet. For a moment I bathed in the luxury of my surroundings but then I remembered where I was and I stiffened, waiting, listening. In the peace of the early morning there was the softest of sounds. It was muffled sorrow, unhurried and gentle. I rose, wrapped myself securely in my gown before steeling myself for what was awaiting me. On the landing, Bessie was between my room and the crumpled figure of Philip, seated on the top step. Her hand was raised as if she had been approaching my door to summon me but had been stayed by the huddled form of her master. Caught between pity and panic she had frozen in indecision. I nodded to her, releasing her from her task. She gave me a brief bob, but her face was grim. She left, her expression grim and as she passed Philip I saw her hand hover over him for a moment before she continued by without the comforting touch she obviously felt she should bestow. I approached with less pity in my heart, but felt unequal to the task of handling the man. I had been foolish to underestimate his madness. He raised his face, wet with tears, but he smiled at me. Smiled. Broad and uncontrolled. Silently, he raised his hand and gestured to the wall. I shook my head with my eyes closed. I crossed my arms impatiently. He laughed, a horrible noise and his finger shuddered insistently. I already knew what he was pointing to and so looked at the canvas. Then I moved forward to his side, my jaw lowering. The golden frame held a room, dark and undefined without any light to illuminate it. I tore my gaze from the painting to my brother-in-law’s crazed expression. The day was shattered into pieces that tore at us. Philip paced from room to room, seeking my sister who had fled her frame. I summoned Albert Carstairs and gestured to my brother-in-law as he moved between rooms with a restless excitement. Albert took my hands in his and made a comforting sound. ‘What is the matter, my old friend,’ he called to Philip, who paused, smiling. I made a noise of distaste, of pain, at hearing my sister’s name, and Albert’s face grew grim. Albert caught Philip’s arm as he passed. For a moment Philip looked confused as to why he had stopped then seemed to notice Albert’s presence, Albert’s restraining hand. ‘She has gone! Flown the painting and is here in the house. Where is she? I must find her before…’ he trailed off and looked at me fearfully. Albert shushed him, and he too looked to me, a curious expression creeping over his features. He looked guilty. They both looked guilty. Then, as if drawn by the same thread, both heads turned to look at the stairs. There was a moment of silence between us, then Philip’s head jerked up to look at the ceiling and grabbed my arm. ‘She's at the top of the stairs,’ he whispered, absolutely terrified. ‘It’s Bessie, it’s obviously Bessie,’ I laughed, despite myself. It was too dramatic, too melodramatic, and had spilled into farce. Both men looked at me and Albert too relaxed into a smile at the three of us clutching each other like children fearing the dark. He gave a chuckle which spread to Philip, looking between Albert and I with moment of clarity. He closed his eyes and placed his hands over his face, laughing softly with relief and embarrassment. He only opened his eyes again when he realised that Albert and I had stopped laughing and he followed our gaze. In the doorway to the dining room, wiping her hands on her apron was Bessie. She had been in the kitchen washing dishes. Looking puzzled but smiling at our good humour, she approached us, and with terrible accuracy she stopped at the foot of the stairs. Philip crumpled into an unconscious heap between us. He shook so hard his teeth chattered. We wrapped Philip in blankets and placed him by the fire, as Albert and I spoke in hushed tones. Albert’s face was shaded in darkness as we sat away from Philip, in the corner of the room. Albert leaned right back, vanishing into the darkness, his hands withdrawing from me. When he spoke, it came from the shadows. I waited for my answer. The kind doctor steepled his fingers in front of his lips, his brow furrowed with deep, dark lines. When he spoke after several minutes, it was halting and careful. He trailed off, his eyes lingering on the shivering bundle by the fire. ‘Go on,’ I urged softly and his fingers rested on my hand lightly. He turned back to me. ‘Nonsense?’ I repeated warily. He nodded, his eyes dipping, but then he met my stare again with determination. I made a noise of shock and disbelief. ‘No!’ I snapped, withdrawing my hand, but he caught my fingers again in his. He tailed off and I waited for more but he was silent again. Together, we led Philip up the stairs to his room. His head jerked at the slightest sound and he called my sister’s name in terrified tones until I snapped at him to stop. As we passed the canvas he whimpered and urged Albert to look, but darkness shrouded it. 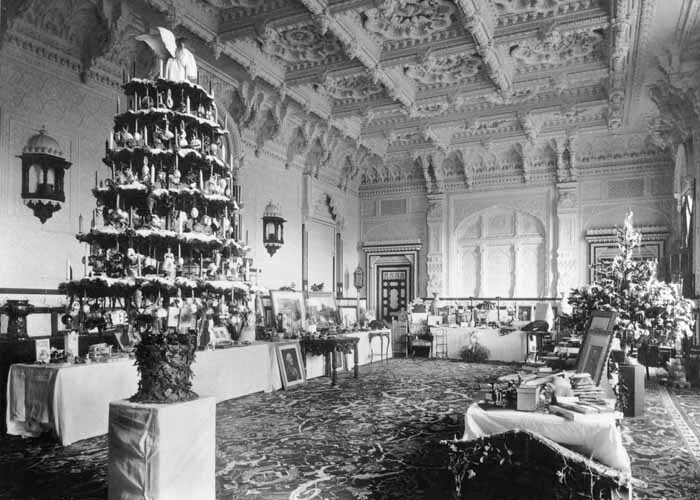 Albert looked to me and seemed to redouble his efforts, heaving the muttering artist along the hall to his room. After Philip had been placed between the sheets and swaddled in blankets, the doctor turned to me. ‘I can’t leave you here,’ he whispered and took my hands. I raised my chin and forced a brave smile. We closed the bedroom door and the doctor squinted into the darkness towards the painting. It was lost in shadow. He turned his gaze to my face, searching it as if to find his strength. I drew myself up in an act of bravery. I thought of my sister, my poor broken sister, at the foot of the stairs, with her husband looking down at her, his hand still raised. ‘It is just a painting,’ I replied, simply. Dr Carstairs found me the next morning, sitting by the fire in the same chair Philip had sheltered in the night before. I too was shaking and a glass of brandy was cradled in my hand. He made his way through the men clearing the hallway of the debris of the night: a broken cup, a torn curtain, the body of my brother-in-law. A sheet covered him as I could not bear to see his face, his stretched mouth, his wide eyes. I could not respond, exhausted by the effort of remaining sane in the face of madness. He sank to the floor beside me, his hand on mine, and he gazed into the fire with me. I wanted to nod, but instead I frowned. ‘Was it an accident when my sister fell?’ I asked hoarsely. I needed to hear it from someone sane, someone outside this house. He looked as if I had wounded him but he relented with the truth. I nodded, my eyes closing, relief flooding me and leaving me peaceful. I remained in London until all had been settled. Our occupancy of the house, Bessie and mine, was allowed by the landlord until all of Philip Archer’s effects could be sold and his bills settled. Albert excused himself from my presence and did not return, his own guilt a barrier to our further communication. I counted his loss as part and parcel of Sophia's return and for a moment felt a twinge of regret, but that passed with the sales and the removals. When everything had gone, all that remained was my meager bag I had arrived with almost a month before, and a trunk of things that by necessity or desire would return home with me. 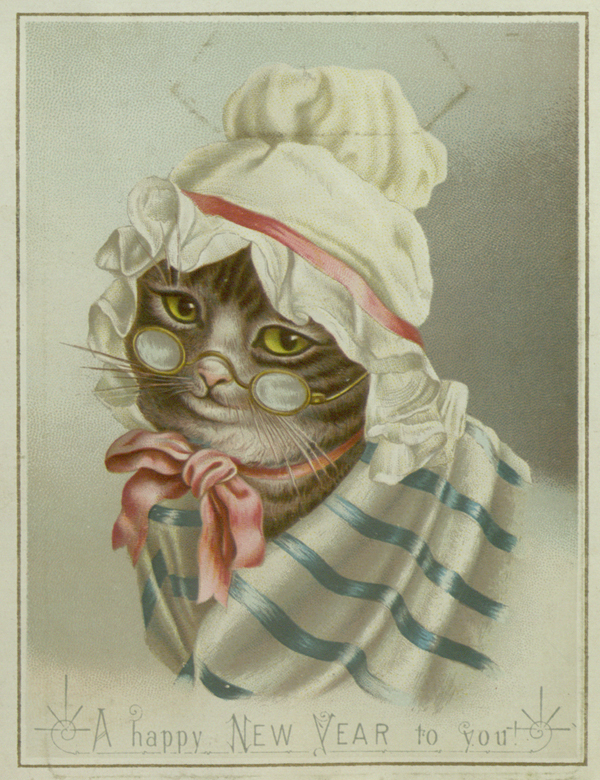 Elizabeth Hemshaw, poor Bessie, faced me in her coat and hat, her bag clutched in front of her. I offered the cheque to her and she took it, concealing it away, fighting a look of guilt. When she looked at me again, it was with sad finality. 'I have so much to thank you for.' I offered, inadequately. She gave a stiff nod and I hoped that it was not guilt I saw in her eyes. She nodded stiffly, then turned and walked out of my life. A carriage arrived and two strong men lifted my trunk onto the back and strapped it in place. In it were my sister’s possessions, to be safely cosseted in my little home back in Oxford, together with four paintings. 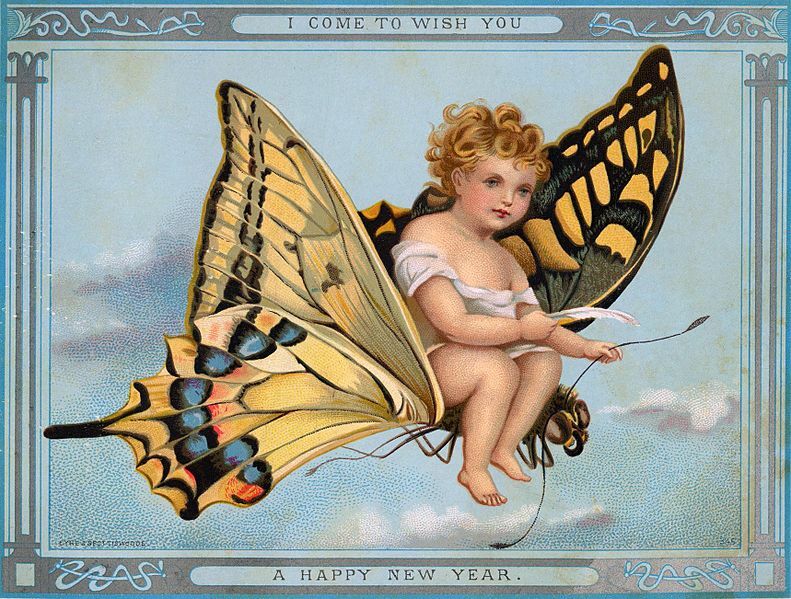 The first was by my late brother in law of my sister, a beautiful angel in a darkened room. 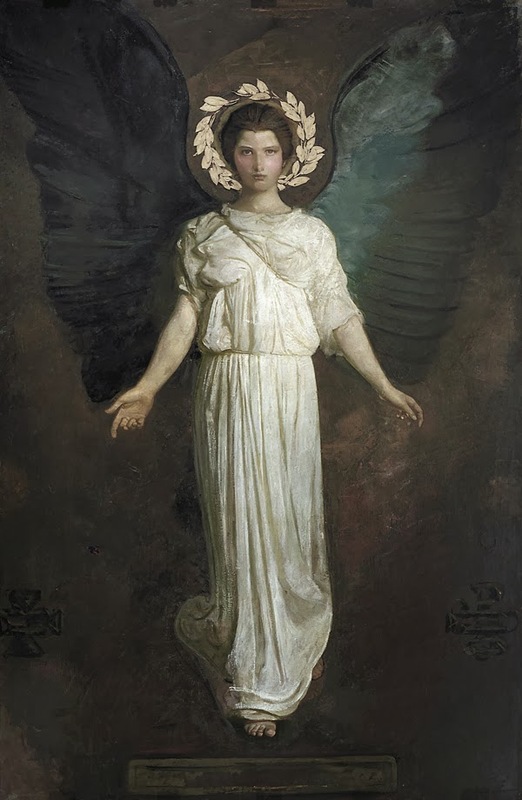 In the first painting, the angel had raised her arms. In the second, she had approached the front of the frame. The third, the room was empty. This has always been one of my favourite images of the nativity. It lacks the beauty of Burne-Jones' epic canvases, or the realistic glory of Marianne Stokes, but for plain straight-out weirdness, you can't beat the girl-only, smallest-stable-in-the-world wonder of Arthur Hughes masterpiece. No-one has any room, it is the epitome of too many people round for Christmas. There are wings and knees and halos all jostling for space. Mary is trying to wrap up her ever-so-small baby but there are people outside and it's impossible. For mid-nineteenth century, this is an amazing use of space on a canvas, and such a powerful image. The body proportions are weird (exactly how long is Mary's thigh? ), Jesus is absolutely tiny but it has an intensity that others lack. The Nativity above wasn't Hughes only brush with an angel. 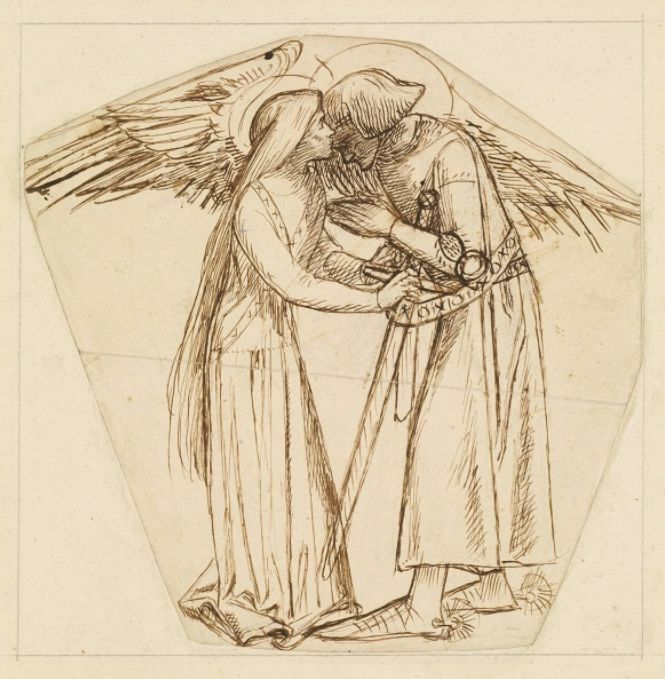 Hughes did both the Annunciation and the Nativity, which is only right and proper, so we have the Angel of the Annunciation with some very impressive wings indeed. Unlike some of the more pushy angels who point at Mary's womb (which is a bit personal, if you ask me) or up at heaven, as if Mary is a half-wit (again, a bit rude), Hughes angel takes the standard primary school nativity pose of cross-your-heart arms. That's proper angel posing there. I love how the gap in the foliage gives Gabriel a mock-halo, and how the fluffiness around the bottom of the wings morphs into lilies. That typical Hughes palate of mauve and gold is all light in the Annunciation, then shadow in the Nativity, but is echoed beautiful between canvases. Never one to leave a story alone, Hughes went as far as doing the Easter bit of the story too with yet another angel. 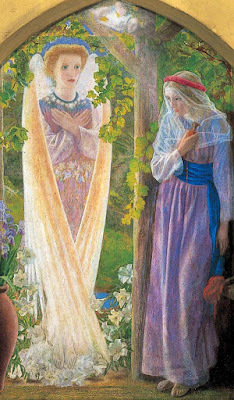 This time, the angel at the tomb is a shaft of light, greeting the women who have come to have a vigil outside the tomb. There is also a nice little glowing dove in the tree behind them. 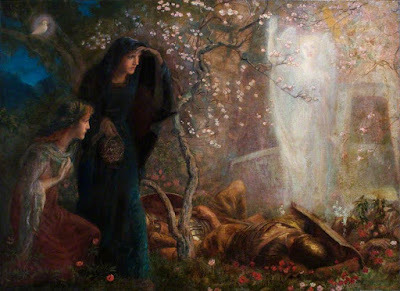 It is a much later work and lacks the precision of the 1850s, which is a shame because The First Easter doesn't feel as individual as his earlier works. Not hampered by his medieval clown shoes, our intrepid knight goes off to find the sacred cup with a trio of glowing ladies. 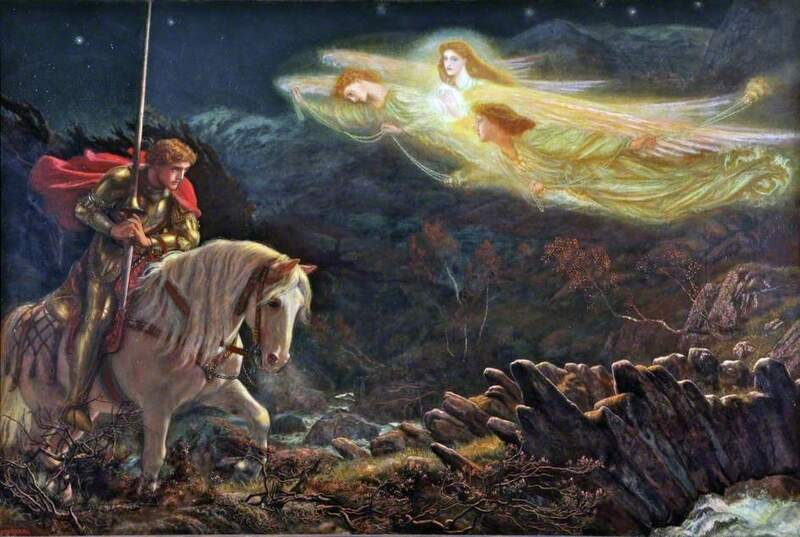 This is a beautifully composed work with the white angels reflecting the white horse, their heavenly light reflected in his armour. I also really like the curving, jutting stones of the bridge which hint at his perilous journey. 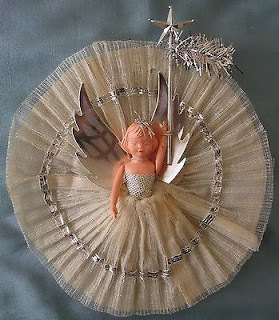 The angels are everything they should be: otherworldly, flying and glorious. Oh deary me. When I first saw this particular painting, I had to ask if the baby was coming or going because forgive me, but that is a weird looking infant who has apparently just walked down those stairs accompanied by five angels. There is also a bit of oddness going on between the baby and the mother's face. Believe me, it's no clearer in the flesh as I get the dubious pleasure of seeing this one quite often at the Russell-Cotes. Don't get me wrong - the angel ladies are lovely, the figures of the parents are solidly done (although I have misgivings about what the father is doing with that shovel), but the baby is just peculiar looking. I know, you are not meant to say that about babies. You are meant to say euphemistic things about Winston Churchill and how they all look cutely funny when they are born. When I had Lily I was in a hospital bed opposite a baby that made the nurses yelp in surprise when they saw it. The little girl had hair all over and sharp little teeth. And she howled for food in an unnerving manner. Bless her. As I conclude my exploration of angels in art I am pleased to bring you an angel who is being less than wonderful for a change. I'm sure this was all very inspirational back in the day but to me it looks like the angel is saying 'Sweep harder child, the Big Man wants to be able to eat his dinner off this floor.' The Victorians are typical of people who feel attacked in their own little world order, they repressed and made it sound like a good idea. You better sweep the floor or Jesus will find out and will be cross. You better not have impure thoughts, have ideas about bettering yourself or question authority because Jesus will see. 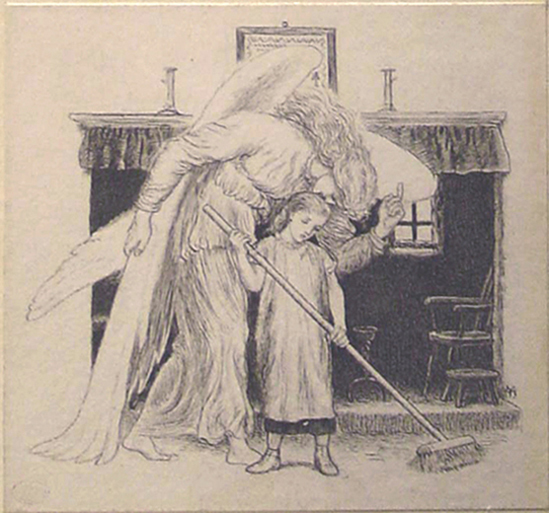 Keep sweeping the floor, young 'un, and you'll get your place in heaven. 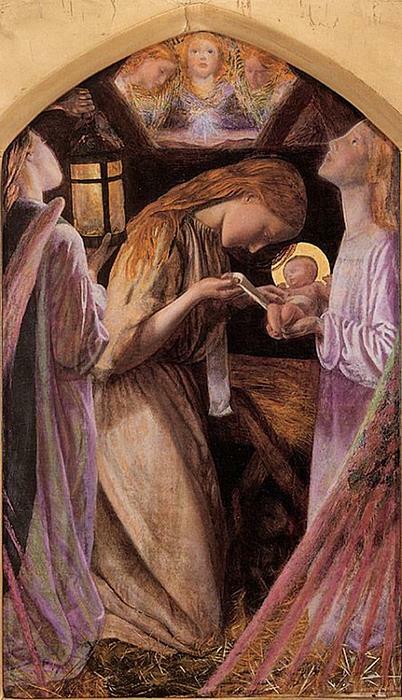 It's all very well if an angel turns up to tell you that you're going to have a holy baby, or that a holy baby has been born or that you have to go and find the holy grail. How cheesed off would you feel if one turned up and told you to sweep the floor? I have a mother-in-law for that sort of thing. I don't need the Angel Gabriel getting involved. Look at the size of that angel! Christmas trees aren't that ancient, as we know. Although early nineteenth century Northern American settlers brought evergreen boughs into their homes and churches at Christmas, the Christmas tree as we know it is linked with Queen Victoria and Prince Albert. The wings are gold and in her hand is a wand. Ah-ha! A wand! 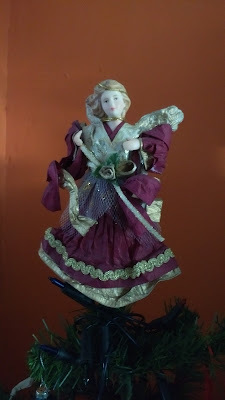 Looking back at our Christmas Tree Fairy, she also has a wand, so that obviously is one that is shared. 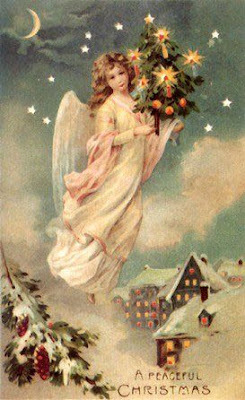 With the angel, the wand is shorthand for the Star of Bethlehem, rather than a magic wand that will make you a party dress at short notice. So both angels and fairies can have star-topped wands, so that isn't any help. How about what's on top of their heads? 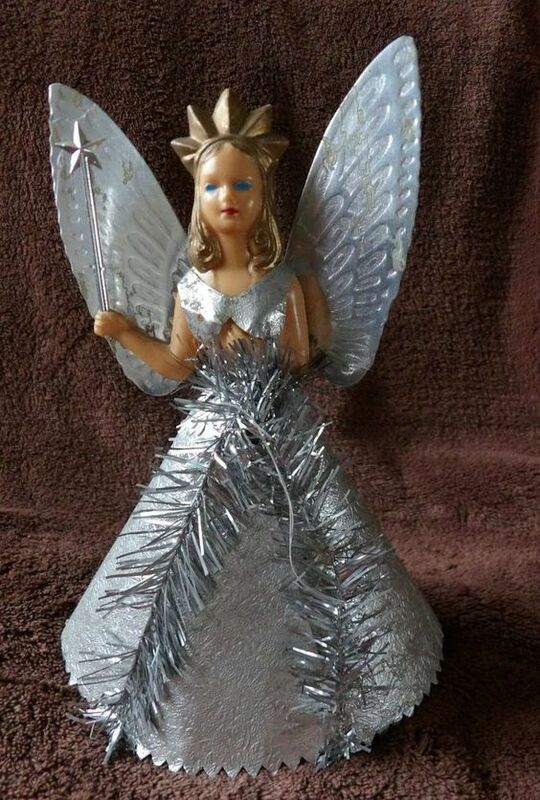 The 1950s angel above has a circlet on her head, but that's not the same as a halo. 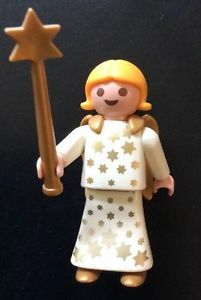 Often angels, like the one in the Playmobil set and Gloria, don't have halos, so that is no indicator, but a fairy does tend to come with a lovely fairy crown. Hang on, I've seen a few Christmas images where the angel is wearing a circle of flowers. What's all that about?! Damn it! Okay, so sparkly crown equals fairy. If she is wearing nothing on her head, a halo or a circle of flowers, then she's probably an angel. Clear so far? Jolly good. 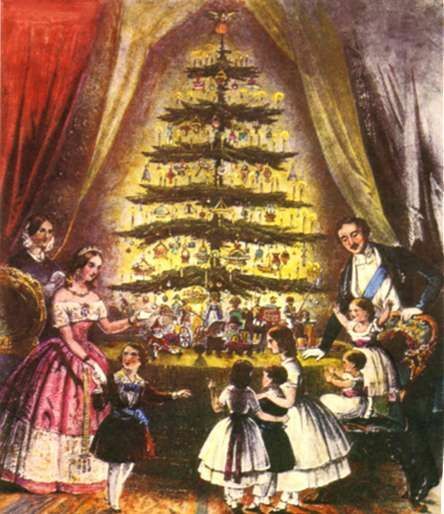 Anyway, back to our Christmas tree story. So Queen Vickie brought a tree into fashion but that doesn't mean that everyone had one. In fact, there was a charity that provided great big ones for communities so you'd have one in your neighbourhood but not necessarily in your home, especially if you were poor. It was definitely more towards the middle of the last century before people started doing it all for themselves at home, which would have coincided with the mass production of plastic-type decorations. 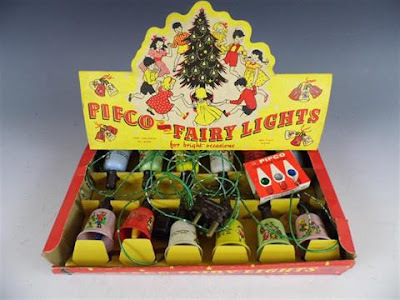 It also is around the same time that toys became more accessible in cheaper materials, and 'fairy dolls' became fashionable. 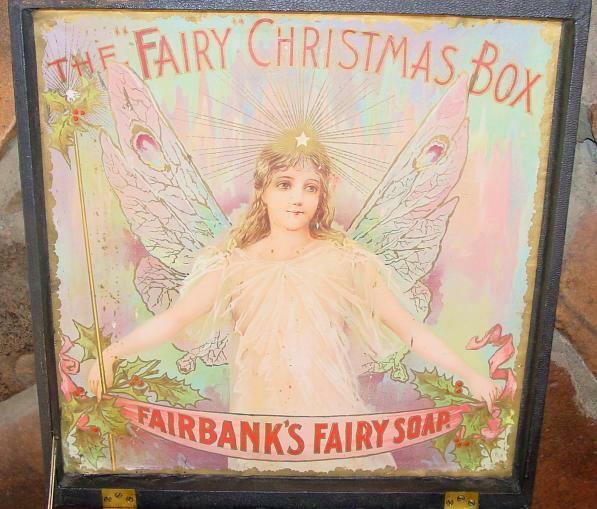 A conflation between a fairy, in her white sparkly dress, wings and wand, and the angel is easy to see. 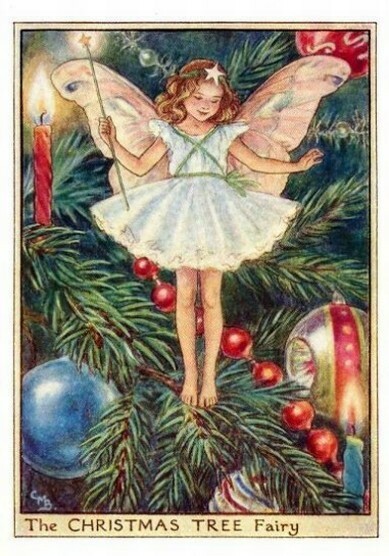 A fairy is more child friendly, less sombre, more modern in many ways. What the flip is all that about?! 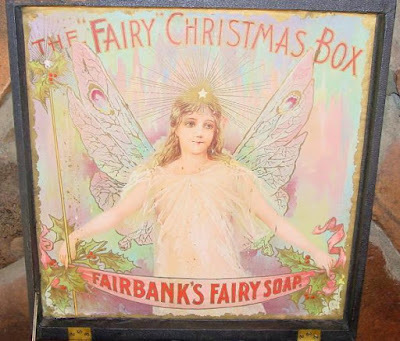 Okay then, to sum up: If they are Victorian, then they are angel, unless they are a fairy. 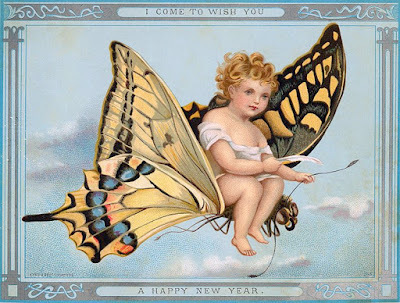 If they have feathery wings they are probably an angel, if they have insect-like wings, then they are probably a fairy. If they carry a wand, then they are either. If they have a crown on, then they are probably a fairy, and if they are wearing a flower ring or nothing, then probably an angel. All clear? Well, quite. Okay, one hard and fast rule exists and that is if the figure has a halo then they are definitely an angel. I do love a nice stamp. 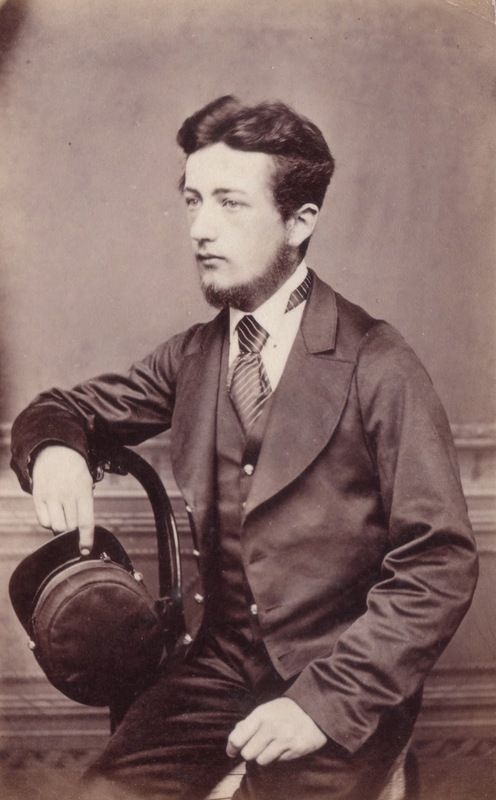 Henry Thomas Bosdet (1857-1934) was born in St Helier on Jersey, but his family moved to London when he was 10 years old. He attended the Royal Academy School in London for his artistic education. He became the Director of the Islington Art School and Curator of the Life School at the Royal Academy, but his painting career was relatively short. Instead, he focused his talents on stained glass. Whilst teaching, one of his students was William Heath Robinson, who described him thus - 'He wore a black velvet coat and an artistic tie. His head was that of a pale young Moses adorned with a long silky beard moustache and waving hair. The finishing touch to this artistic personality was the gold-rimmed monocle with continually dropped from his eye and was replaced as he took a broader or closer view of your drawings.' (My thanks to this page by Maya Hammarsal for the details). 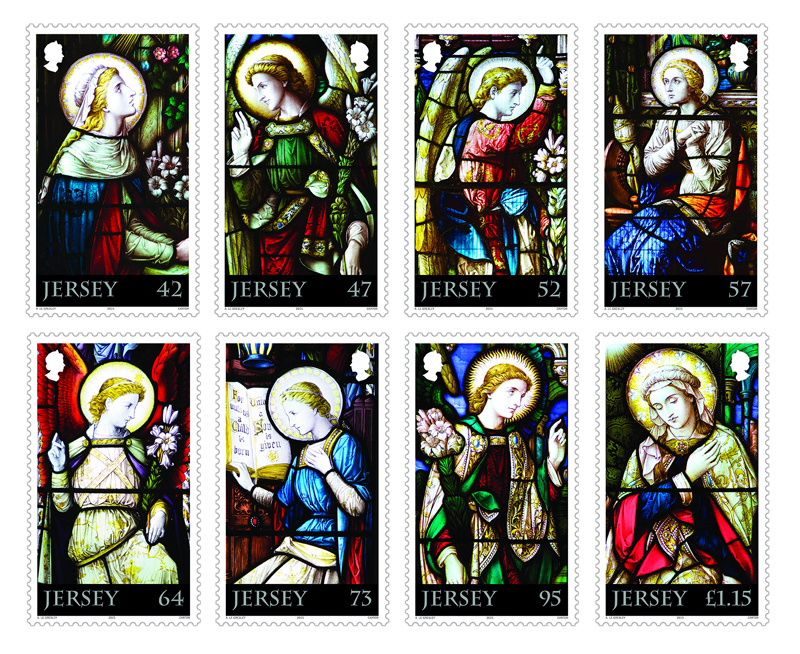 He returned to Jersey in 1920 and many of his windows can be seen throughout the Island today. In many ways we have Henry VIII to thank for Henry Thomas Bosdet's fame as it was due to the Reformation that Jersey lost so much of its stained glass. 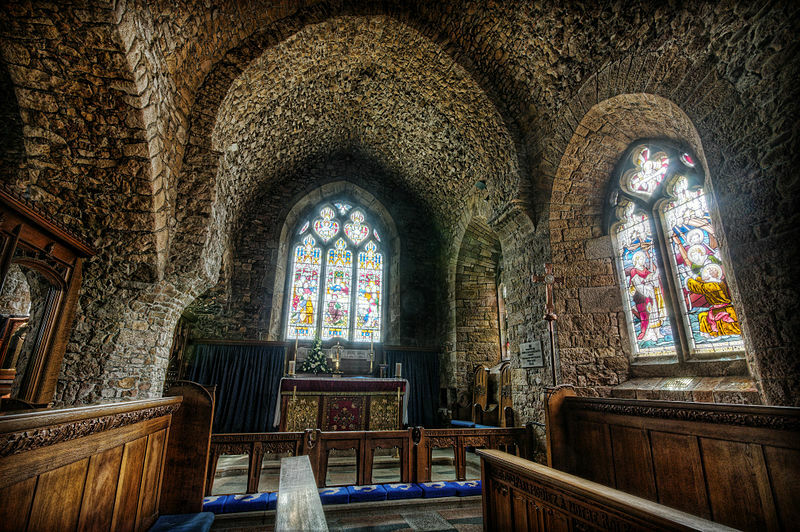 I can't imagine what it must have been like to attend your familiar church which used to be plainly glazed, only to have that jewelled light suddenly pouring through those beautiful windows. 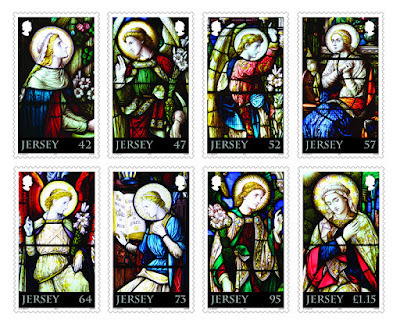 The Walker family have been discussing a holiday in Jersey and I think a tour of all the stained glass seems a very splendid idea. A note about the above church, St Brelade's, which I think some of you would appreciate - apparently, when it was being built the fairies didn't appreciate it being constructed in the middle of their land and so they moved it every night until the builders got the message and built it where the fairies dumped it. Seems sensible to me, you don't want to go messing with fairies. Stained glass windows are an inexhaustable resource for angels. You can buy those little sticky panels for windows to illuminate your home if you can't afford the real thing and they always make me smile. There is something about the medium that suits the luminous beauty of angels, their wings alight with sunlight on even the coldest day. I sometimes wonder if stained glass was put there to give you something to look at during a long sermon, and however you feel about religion, going into a church gives you the chance to admire some fascinating workmanship and artistry, especially of the Victorian period.